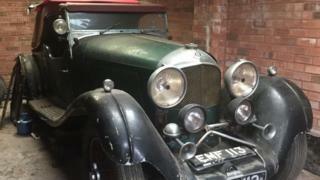 A rusty 1936 Bentley which spent the last 30 years locked up in a garage has sold at auction for £454,250. The car was owned by World War Two pilot Charles Blackham, who took part in a raid on Adolf Hitler's Bavarian retreat, and was one of just six of its kind made by Bentley. H&H Classics sold the "unusual" car for more than double its estimate. Mr Blackham, from Stockport, bought the car in 1952 for £260 and drove the classic convertible for 36 years. It was then locked up in his garage for three decades and only rediscovered after the 96-year-old's death in January. The car, which now has "torn leather seats" and is "covered in rust", is one of just six WO Bentley 4.5-litre cars assembled by the service department from stockpiled and reconditioned parts in 1936. Damian Jones, head of sales at H&H Classics said the car - which was sold at the Imperial War Museum, Duxford, on Wednesday - was the "ultimate Bentley barn find". "This Bentley is so unusual because it was assembled in the mid-1930s using a chassis and mechanical parts which dated from no later than 1931," he said. "Only the body was freshly made when the car was assembled and sold as a new car in 1936." Mr Blackham served in the RAF 550 Squadron and took part in the bombing raid of Hitler's famous mountain-top retreat in the Bavarian Alps in April 1945.